My philosophy is based on building a happy, healthy and balanced lifestyle. I am continuously learning and working on creating this strong foundation in both my mind and my body, while teaching my children to do the same. In terms of food, my philosophy is extremely simple - I like to eat the foods that are biologically suited to our species to help maintain optimum health and vitality in my body. I believe we are Frugivores. From everything I have read and researched so far and most importantly, from my own personal experience, this theory makes sense to me. A frugivore consumes mainly fruits, nuts, seeds, sweet vegetables and herbs. Biologically, our make up is very similar to many primates such as apes, chimpanzees and monkeys of whom are also frugivore species. Aside from this, these are undoubtably the food groups that make me feel the most alive, alkalised, energetic, robust, happier and healthier than any other food. Therefore, I personally consume an abundance of raw fruit, vegetables, nuts and seeds on the daily! Fruit would make up the main percentage of my diet and is where my favourite moto 'Eat More Fruit' comes from. I believe there are many misleading claims about the sugar content in fruit which has lead to a decrease in the consumption of this highly powerful and importance food source. I try to eat an alkalising diet and as close to nature as possible, always ensuring my fridge is stocked with fresh fruit and vegetables. I visit my local weekend markets for a wide variety of leafy greens, sprouts, fresh herbs and many other fresh seasonal fruits and vegetables. Following my detox last year, I now keep it simple and would consume about 95% raw fruit and vegetables, nuts and seeds as well as a little cooked food such as sweet potato, vegetable soups or quinoa etc. Many people have asked me if I get bored with eating this way but the truth is, never! I love the food I eat, I crave it and I thrive on it. My family also enjoy a vegan lifestyle and enjoy many of the meals I share on my instagram account @rawandfree. 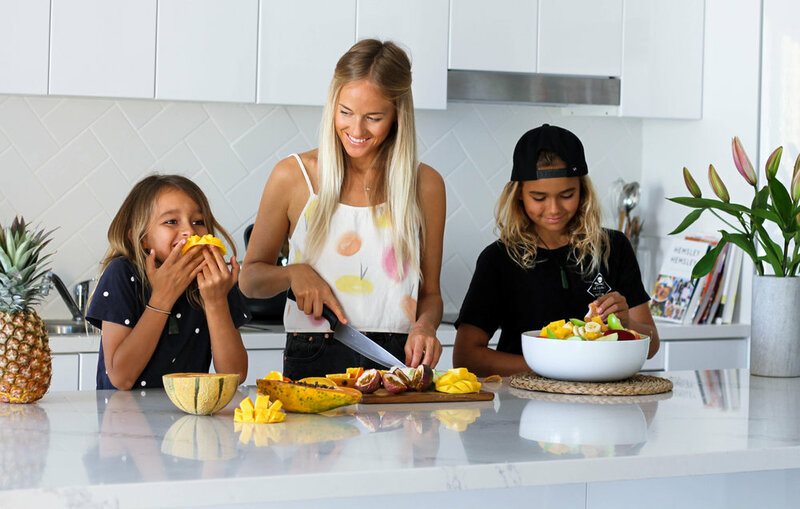 They don't eat to the raw and limited extent of how I eat but over the years, I have slowly transitioned my children from the standard diet most of society consumes into a healthy vegan diet. By no means do they eat perfectly but after educating them, they now understand and enjoy this lifestyle. I believe it's all about balance. I try to ensure that majority of their diet is made up of a variety of healthy plant-based foods including lots of raw fruit and vegetables while still allowing them to have fun exploring other food with friends and family and enjoying treats now and then. I also believe that adequate sleep, rest, relaxation, exercise, breathing, fun and laughter are all as equally important in a healthy lifestyle and I try to incorporate these things into my life as much as possible! Life can become busy and time can get away on us, (this happens to me ALL the time) so I often have to stop and remind myself of these extremely important factors. I also believe that prevention is everything. It's not about what we do occasionally but about what we do everyday that will have the long-term effects on our heath and well-being. It's about common sense, in all aspects of life and about not following all of what society teaches us to do and to believe. We are all individual human beings with different dreams, needs and desires and it is so important to listen to our true self. Our mind and our body are a bit like a puzzle - when all of the pieces align together, I believe it creates the perfect platform for anything - including our wildest dreams!